We just received our (hopefully) final attendance confirmation for the Unmet Needs workshop to be held at Cendrawasih University’s Faculty of Engineering Auditorium the next morning, putting our RSVP list at exactly 50 attendees. Definitely an increase from our initial estimate of 30-35 people. A wide range of participants is set to attend including local government officials, local NGOs, the private sector, farmers, as well as representatives from Universitas Cendrawasih, meaning that nearly all related stakeholders in the agricultural value chain will come together in the same room. With the participants' list seemingly final, our checklist was almost complete. The only task left was to ensure that, in an event with such diverse participants, everybody was given an opportunity to speak up. Collaboration among a range of stakeholders has always been in mind for the Kopernik’s Unmet Needs project given that finding impactful solutions to address the challenges of smallholder farmers is not a one-person or one-organization job. This focus on collaboration among various actors in the sector was first initiated through the 2016 Unmet Needs report launch event in Jakarta where Kopernik invited the private sector, NGOs, the central government, and the general public to come together and think about ways to tackle problems of inefficiency and crop losses for Indonesian farmers. In the 2018 Unmet Needs Papua Kalimantan project, we compiled and analyzed fieldwork findings from Papua, West Papua, and West Kalimantan to identify the needs of smallholder farmers in the three provinces. While echoing the message from Jakarta two years prior, the dissemination events for the Unmet Needs Papua Kalimantan report in July had a more a local focus. 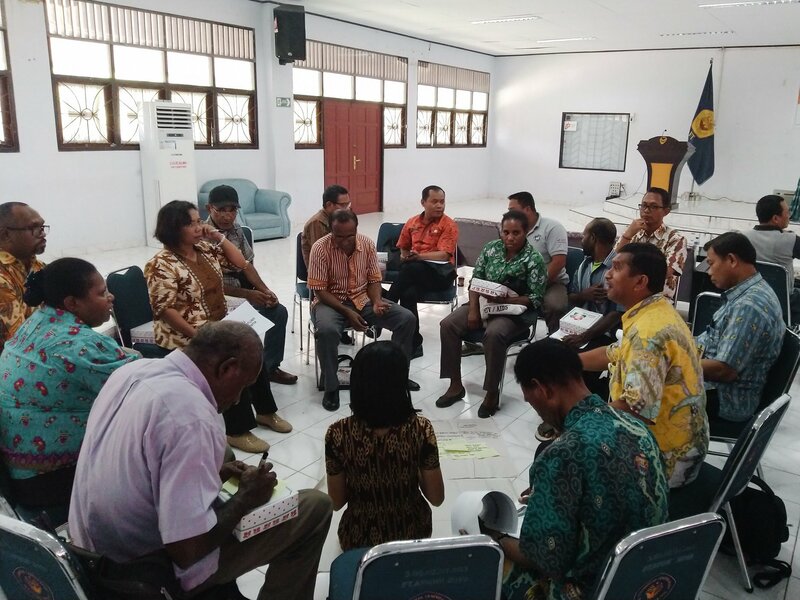 Held separately in Sanggau, West Kalimantan on July 18 and in Jayapura, Papua on 24 July, the mission was to initiate collaboration among local stakeholders with direct connections and understanding of the local farmers. Among the participants in Jayapura were 20 officials from various departments of local government, as well as representatives from the Indonesian Environmental Forum (WALHI) and WWF. We were also excited to welcome representatives from Cendrawasih University given that academic institutions are an important stakeholder in the agricultural value chain, especially to provide inputs and feedback to programs or develop technology solutions. As with most gatherings that include diverse backgrounds and perspectives, there were some heated discussions during the event, particularly between NGO and government representatives related to the issue of sago and cacao farmland conversions. 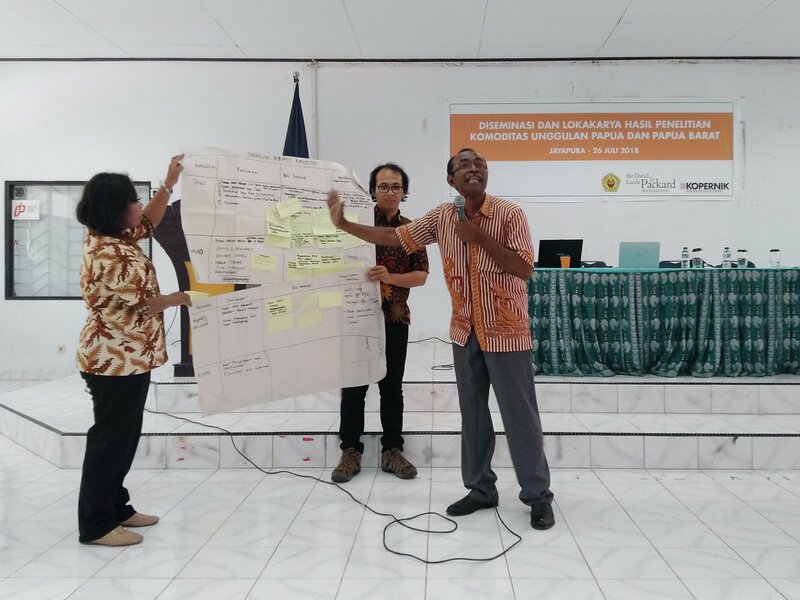 But by the end of the day, Kopernik’s mission – to facilitate a constructive dialogue and initiate collaboration between the stakeholders – seemed to have made its way among the participants. During the group discussions, a recurring theme when talking about what is needed for effective interventions to address the needs of farmers was synergy and better coordination between various stakeholders, including all parties present at the event, while also involving village customary chiefs. “If Kopernik wants to find the best solutions, then you guys are on the right track. Inviting us (locals) all here to talk and discuss - that is indeed the best way forward for now,” said a representative from a non-profit organization based in Jayapura during one of the Q&A sessions. The event was also an excellent opportunity for Kopernik to expand networks in the area. As we’ve identified in the Unmet Needs Papua Kalimantan report, many farmers in Papua and West Papua are still struggling with productivity, opening many opportunities for potential solutions. A few local organizations, as well as ECOM Papua, were already interested in the K-Solar Dryer, asking us for the solar dryer manual. Cendrawasih University even expressed their willingness to help if we ever needed extra manpower to collect data in the field. While it may be too soon to say, our initial experience in sharing and connecting in Papua has been fruitful with many insights and we are excited to pursue future endeavors with our new friends in the land of the black pearl. A similar event to disseminate findings in West Kalimantan was also conducted in Sanggau district, read the write-up here.